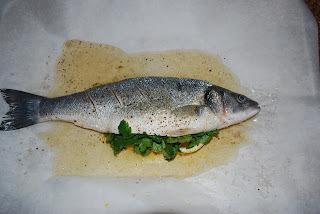 Lay a piece of parchment paper (big enough to wrap the fish) on a baking sheet. 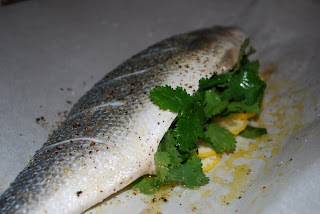 Make 3-5 small slits (1-2" long) on each side of the fish. Oil the the fish, inside the cavity and all over the skin. Season with salt and pepper. Fill the cavity with lemon slices, garlic, and cilantro. Add the white wine. 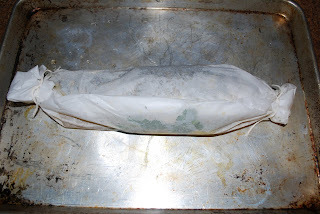 Wrap the fish in the parchement and tie with twine, if needed. 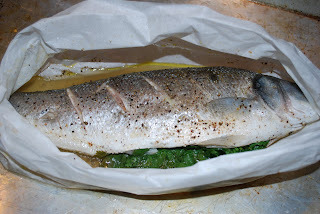 Bake for 20 minutes, until fish is white and still moist. 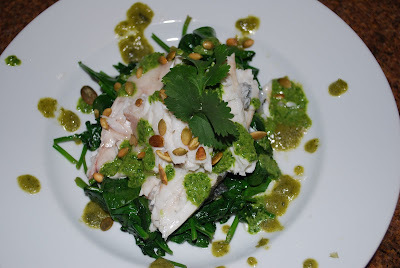 Serve on a bed of wilted spinach with Cilantro-Pumpkin Seed Sauce and Roasted Poblano Vinaigrette (recipes follow). Now that it's done...what do I do!? Using a sharp knife or fish knife, cut between the head and body until the knife touches the backbone. Repeat on tail end. Insert knife at tail end, and cut from backbone to cavity. With knife resting against backbone, cut up to head. 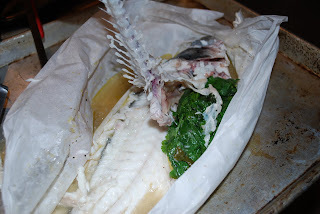 Insert a spatula underneath flesh of fish, on top of the backbone and lift. **These sauces are the perfect accompaniment to this fish, but also pair well with chicken (especially prepared with this rub). Combine cilantro, pumpkin seeds, shallot, garlic, vinegar, spinach, and 1/8 C. of water in a blender and blend until smooth. With the motor running, slowly add the oil and blend until emulsified. Add honey, salt, and pepper. The mixture should be a slightly loose sauce consistency. Store in the refrigerator, for up to one week. *The recipe has been modified slightly. 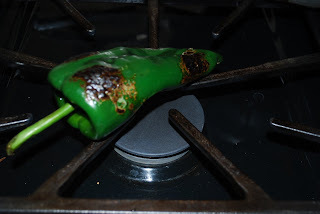 Combine pepper, vinegar, garlic, honey, and 1 T. cold water in a blender and blend until smooth.